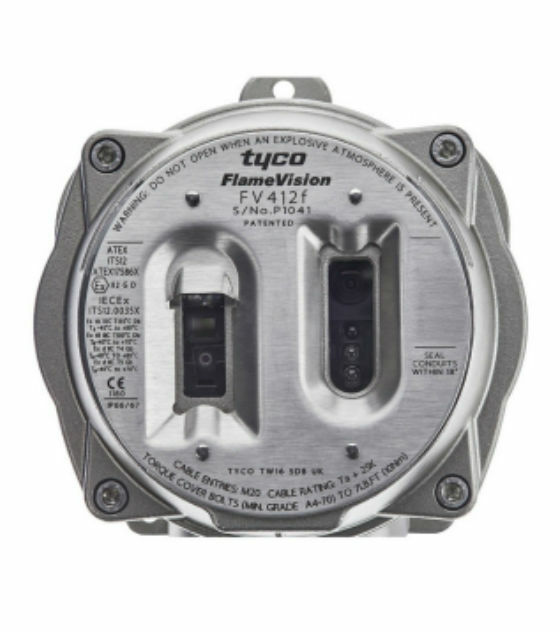 The 3M Scott Safety FlameVision FV400 Flame Detector uses Triple IR solar blind technology for flame detection. FLAMEVision FV400 uses Triple IR solar blind technology for flame detection. This provides a reliable and cost effective solution in standard flame detection applications especially where there is a single hazard in the field of view. The FV400 FLAMEVision detectors use Triple IR solar blind sensing technology and flame detection algorithms to provide high performance sensing capabilities for hydrocarbon fires. This includes the ability to reliably sense flames through high densities of solvent vapors and black smoke, increasing the probability of early detection with consistent detection of many different types of hydrocarbon fuels from alcohol to aviation fuel. Multiple interfaces are provided with the option of an integral CCTV camera to provide a visual means of operator verification.